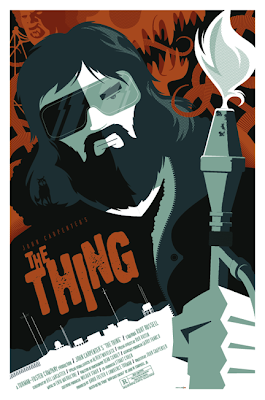 i recently had the incredible opportunity to work on a poster commission of one of my favorite horror movies of all time: john carpenter's "the thing"! i love the sense of dread and uncertainty that the film delivers, even upon repeat viewings. and there's just something to be said about action/horror ensemble casts from the 80's...from "the thing" to "aliens" to "predator", it just seems like filmmakers knew how to flesh out supporting characters well enough to make you genuinely care about them. seems kinda like a lost art to me. anyway, i hear there's a prequel/sequel to "the thing" in the works. i won't write it off this early in the process, but i will say that it'll be a minor miracle if the filmmakers can create something worthy of standing alongside this 80's masterpiece. apparently that james cameron guy did this little movie called "aliens"
before he hit it big with "avatar". who knew? joking aside, this is one of my all-time favorite movies. ever. and the queen is one of my all-time favorite movie monsters (stan winston, you devil!). 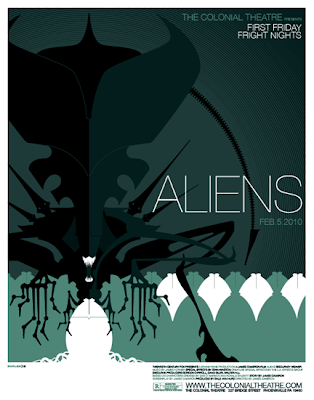 you can imagine my glee 6 months ago when i found out that the ultra-cool colonial theatre in phoenixville, pa would be showing a print of aliens as part of their "first friday fright nights" film series on february 5, 2010! with anticipation building over the past few months, i decided to approach the theatre and ask if they'd be cool with me creating a limited edition print that would debut at the showing. they were into the idea...and this is the result. i can't wait for the movie and to see how the print is received! "get away from her, you bit¢#!" this is my submission for myplasticheart's annual new moon exhibit where artists interpret the signs of the chinese zodiac. so you're asking yourself "uh, what the hell is that thing?". here's as succinct an answer as i can provide: after immediately picking the rooster as my animal to interpret (because i've never drawn one and they're hella cool), i did some cursory research on the chinese zodiac, and noticed that 1945 was a "year of the rooster." digging a little deeper, i found out that the chinese military machinery used in WW2 was a patchwork of vehicles and weapons imported from a myriad of other countries. with all of that info in the blender, i hit "puree" and the result is a 7-meter tall instrument of annihilation that has tank treads for feet, chest mounted cannons, a crew of 3 and a really sour attitude. thanks to john wong for inviting me to be part of the show. i can't wait to see what all of the other participants came up with! helloooooooooooo 2010! 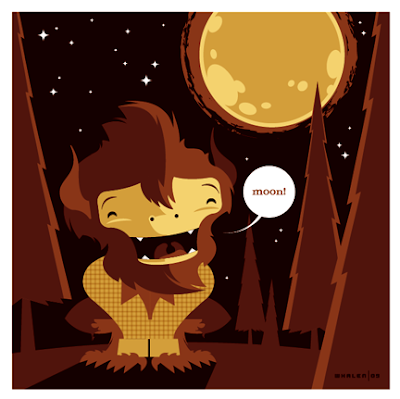 the first post of the new year is one of the last illustrations that i worked on in 2009...an image of my son as a wolfboy. because he was recently in a phase where he asked to see the moon roughly 31,000 times a day. there were many trips to the front porch to check on his favorite heavenly body...leading me to surmise that he is part werewolf. at any rate, i made a print of this image for him and gave it to him for Christmas. should make for a great conversation piece when he's older.